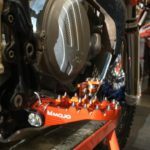 If you’re not sure how to install dirt bike grips, it’s a pretty simple task, but there are a few different ways to go about it. I’ll share the way I do it and give you a few alternatives, so you can choose which suits you. 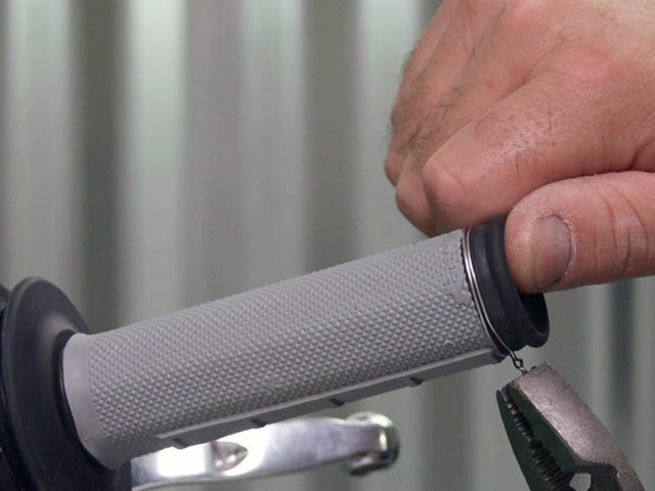 If your old grips are falling apart or causing blisters on your hands, fitting new grips can make a world of difference to your riding enjoyment. 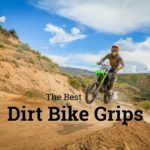 How often should you change your grips? When the surface bumps are worn down and they don’t provide sufficient grip anymore. If the grips slip around the bar when you are riding. This can be very dangerous. If you just want to bling your bike up with some colored grips, they’re a pretty cheap product. If you don’t intend to keep them, the easiest option is to just cut them off with your box cutter. 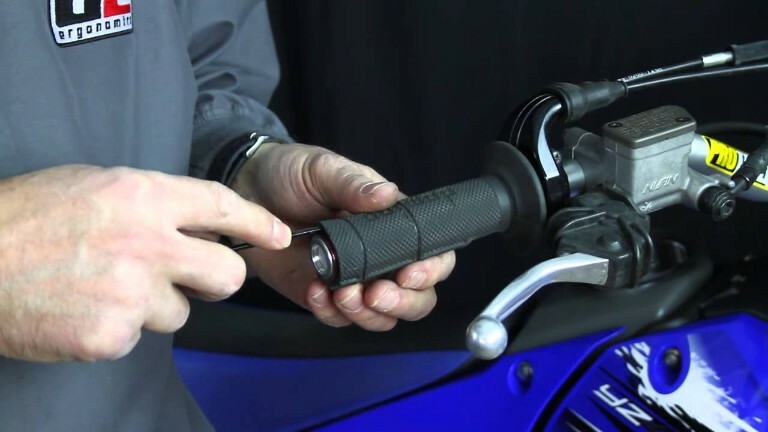 If you are keeping them, take your small screwdriver and slip it between the handlebar and grip and pry them off. Rotate it around the bar to break the seal of the old glue. Some people spray some WD40 or contact cleaner inside to break it down. Another option is to use compressed air to pop it off if you have access to a compressor. Use contact cleaner or acetone and a rag to remove any old grime and glue. 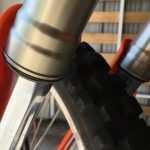 This is very important to ensure a good bond between your bars and the new grips. It may be necessary to use a scouring pad or wire brush to clean up the knurled bar surface in preparation for the new grips. 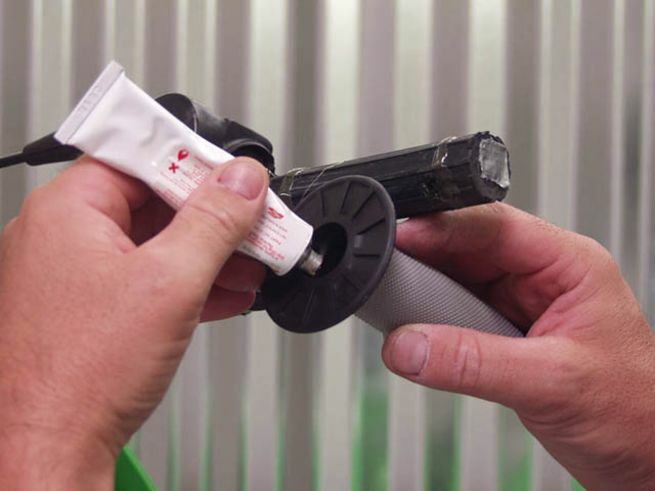 Some people heat up the grips with a hairdryer to soften them up and make them easier to slide on. Depending on the glue you use, it may not be necessary. The glue should act as a lubricant until it becomes tacky, so speed is of the essence. Note: one of the grips has a larger hole diameter. This is the one that goes on the throttle side. Be careful not to mix them up. Tip: poke a hole in the end of the grip to allow air to escape as you push them on. If you’re fitting handguards, then you’re going to cut the ends off anyway. Tip: If you’re competing it’s sometimes mandatory to plug the end of the handlebar with a washer or coin before fitting the grips. This is a safety precaution and makes the end of the bar less of a hazard in the event of an accident. 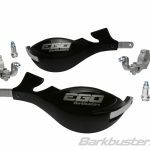 If you’re not installing handguards, there are some good handlebar end plugs available which are another good way to add some bling to your bike. The Glue: Manufacturers say to use their glue with their grips – That is: Pro Taper grips with Pro Taper glue, Renthal grips with Renthal glue. The reality is you can use any grip glue, shoe glue, superglue or even spray paint. 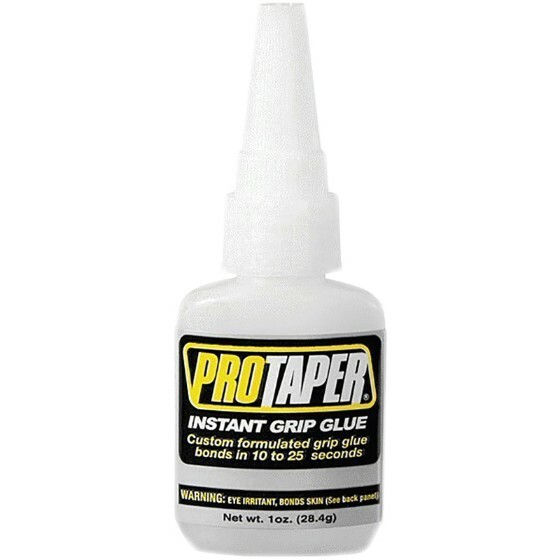 Pro Taper Grip Glue is a good one. It’s widely used by race teams. 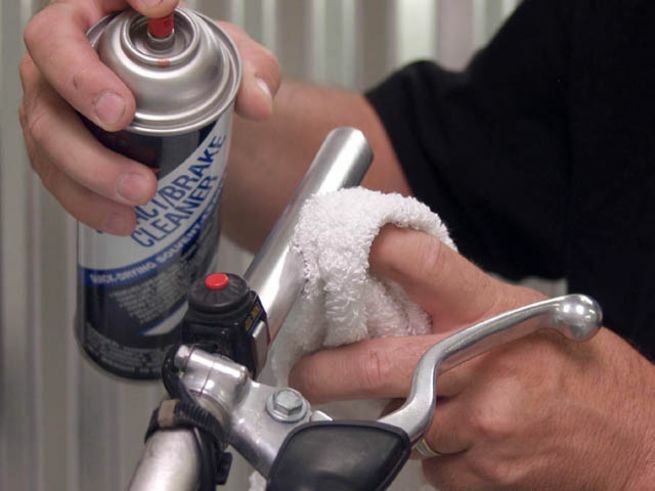 Spray or squeeze a small amount on the handlebar and inside the grip. Quickly slide it on and twist it round to the desired orientation if you’re using half-waffle grips. This helps to smear the glue evenly around the bar. If you are using half waffle grips, the waffle should face down. The waffle is designed for your fingertips to latch on at the bottom. Wipe off any excess glue. 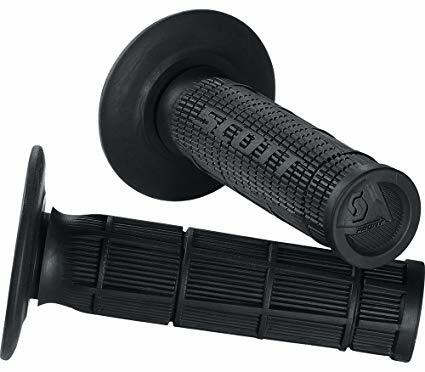 Scott Sports Black Radial Half Waffle Grips are a popular and widely used grip, and very cheaply priced. Do the same on the throttle side. The difference is that you can only rotate the grip upwards to avoid opening the throttle when twisting it on. If the throttle tube has a hole in the end, use duct tape to cover it to prevent glue getting in and threatening the smooth throttle action. Allow at least 8 hours for the glue to set before you ride. This isn’t mandatory, some people prefer not to, but if you ride pretty hard or compete, its a good idea. Some grips have grooves in them to allow the wire to sit flush with the surface. If you intend to wire them, make sure you buy grips with the wire grooves. Double wrap the wire around the grip, being careful not to cross it over. Give it a few twists with your fingers at the bottom. Tip: Cut it off to the right length, then remove it from the bar, straighten it out, then use it as a measure to cut the other wires to the same length. Replace the wire, then twist it at the bottom of the grip. This is where the special safety wire pliers make it easier, but if you don’t have those, normal pliers will do. Twist it nice and tight. Cut the wire off about half an inch (12mm) from the grip. Before you fold it in bend the end over 90 degrees to make a small hook. This allows you do dig it into the grip when you fold the wire down and hides the sharp end. Always fold it towards the front of the bike. This makes sure it doesn’t catch your fingers as you hold the grip. Make sure the wire is pushed into the groove in the grip so that you don’t feel the wire with your hand. Apply the wire in 2 or 3 places on the grip. The grooves in the grip make the positioning easy. If there are no grooves in the grip make sure the wire is no closer than about 12mm (half an inch) from the end of the bar, or it may slip off the end and damage the end of the grip. Ride with loose grips. They could even come right off if you don’t use handguards. Leave tie wire ends protruding. To avoid stabbing your fingers make sure the twisted end is pressed into the grip. Ride without plugged bar ends. In a crash, the blunt bar end could stab you or others. Some riders prefer to wire the grips only, and some prefer glue, some do both. Racers generally prefer to wire them as glue can fail sometimes. Its personal preference, the decision is up to you depending on the type of riding you do. 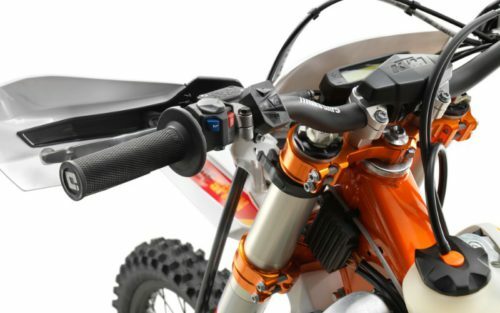 Do you have any tips to make installing dirt bike grips any easier? What grips can you recommend? Please feel free to share your thoughts below.